University Greenways | Working towards a thriving University District where everyone can safely walk and bike. Working towards a thriving University District where everyone can safely walk and bike. U District Block Party Tues, Aug 5! We’re closing the street and opening it right up for people! 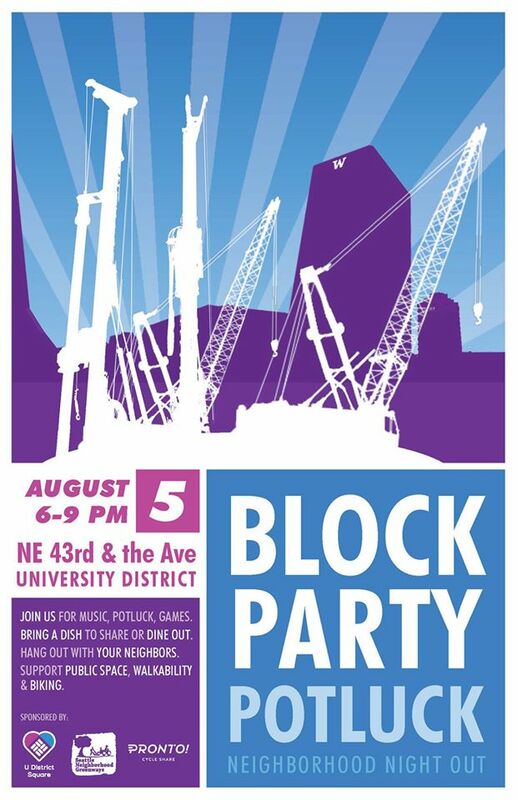 Tuesday, Aug 5 from 6-9:30 pm U District Block Party at 43rd and University. Come eat, listen to live music and play games. Learn about light rail, bike share, green streets and more! Join University Greenways, U District Square and Pronto Cycle Share for a potluck, music, games and a chance to imagine a more walkable, bike-friendly U District. Join the discussion. Learn about a planned parklet at 43rd and University Way, bike share stations that will open this fall, Seattle’s green street designs for the area, upcoming University Greenways projects and the future light rail station that is under construction right now. This trio unleashes an upbeat walkabout band playing eclectic music from all over the world, like second line, world banda style, Mexican and kleismer. A Piano and Cello Duo. Join in the fun and sing your heart out. You can RSVP and connect here. Bring your bike, kids, a dish, & a sense of adventure. Or just show up: there are plenty of dining options around, and much fun to be had! 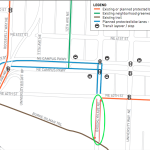 More Galleries | Comments Off on What is a Neighborhood Greenway? Imagine if you could get anywhere around the University District in about 5 minutes — safely and comfortably. No more 30 minute walks in the rain or long waits for the bus. And no more long searches for a parking spot. No spandex or gym practice required. That’s our dream for bicycling in the University District. To learn more about why we believe the University District is ripe for safe bicycling facilities, check out our presentation “Safe Bicycling, Livable Streets”. This presentation highlights the needs and opportunities that we see in the U-District. We originally gave it in May 2011 to an enthusiastic reception from representatives of the Seattle Department of Transportation, Seattle city council member Sally Bagshaw, and Seattle Bike Advisory Board chair Blake Trask. Now we’re here to bring our community together and make the dream of safe U-District bicycling into a reality.